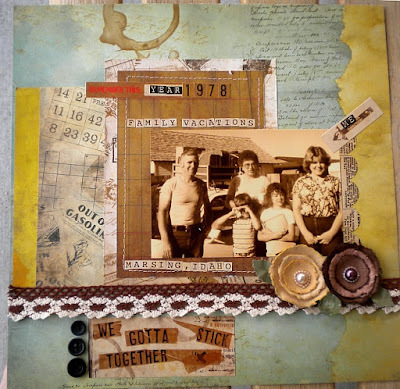 Today I am showcasing some fantastic supplies I used from 2 of my favorite online Scrap supply stores. The paper is the very fun Bo Bunny Et-Cetra line. Scrapalicious USA has these papers along with all the coordinating sticker sheets and chipboard elements that go along with the set. The beautiful Websters Pages Lace I acquired from Paper Patch Crafts. The vintage look and colors I think matched the layout perfectly. I popped on a couple Prima flowers, some buttons and a little machine stitching to finish it up. Paper Patch Crafts is having a challenge now through midnight tonight using this layout. Only requirements is a little hand or machine stitching and buttons. Join us!! great layout! love these flowers. I always love the stitching. It adds such a great element. What you were saying also makes me want to find some family pictures of my parents where I know that I'm now older than them in the photo. What a strange concept.